When your car is exposed to the elements for an extended period of time without proper sealant or maintenance, it may eventually start to exhibit a chalky appearance. 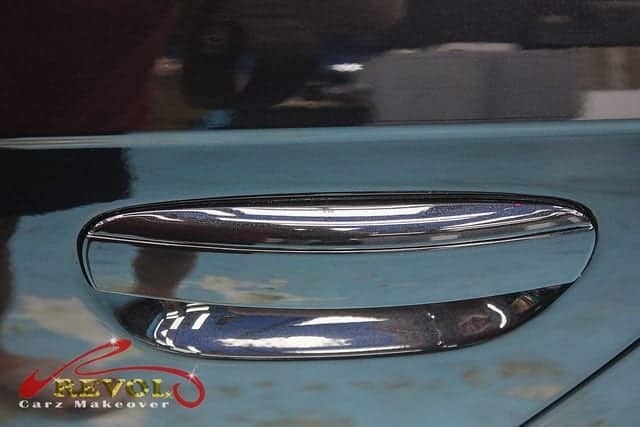 This type of paint damage is also known as UV fading or oxidation. 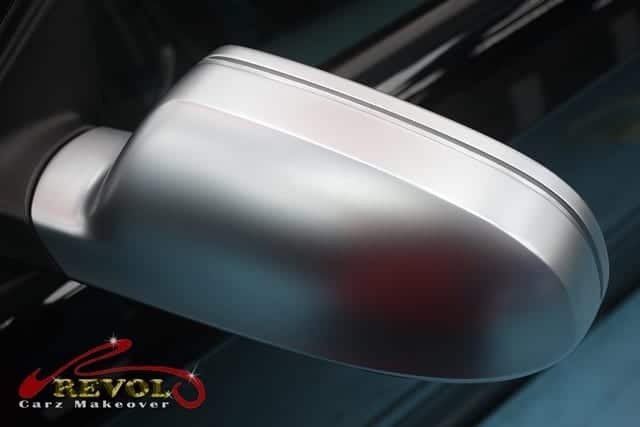 If your car’s paint is looking dingy and faded or you’re just looking for a change of color, it is a good idea to drive up to Revol Carz Makeover for a friendly, non-obligation assessment and honest quotation. 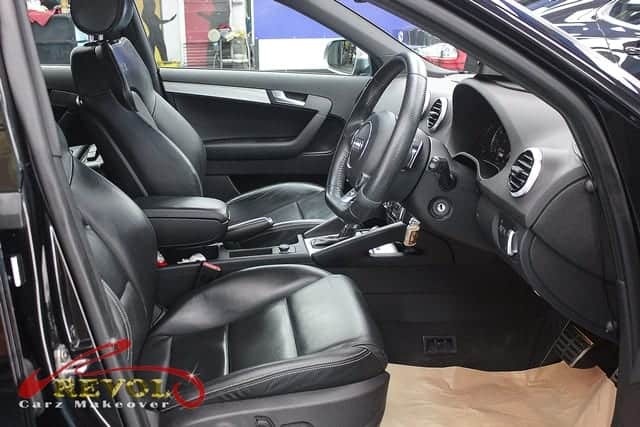 Our skilled and qualified spray-painters with specialized equipment, premium paints and creativity can turn your car into a picture perfect showroom gem. 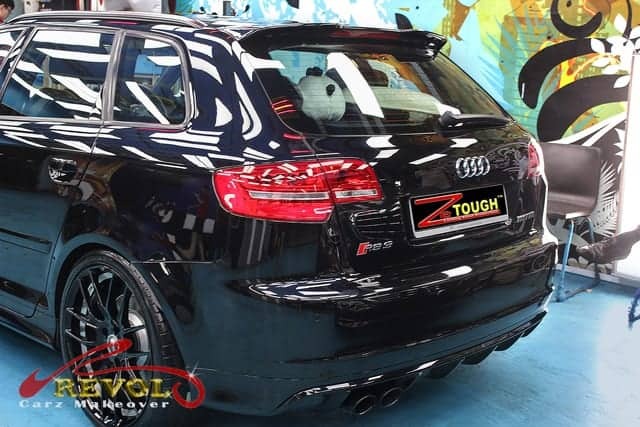 Wow at the lightning-fast Audi RS3 Sportback 2.5 which indulged in a Revol’s full body re-painting that transformed the car to a sensational showroom masterpiece. 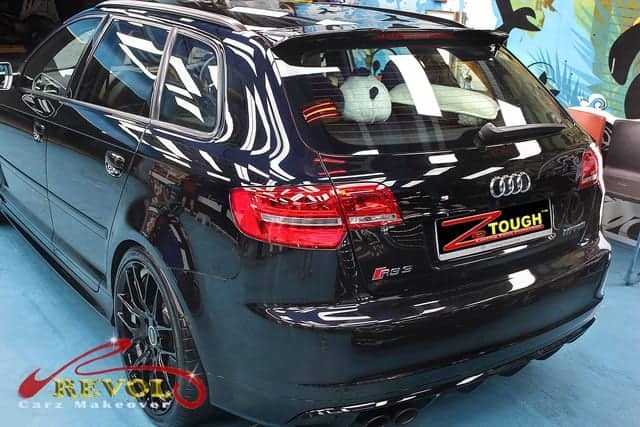 It is no secret that the top treatment of ZeTough Ceramic Paint Protection Coatings ensures the new paintwork always stays glistened and well protected throughout the car ownership. 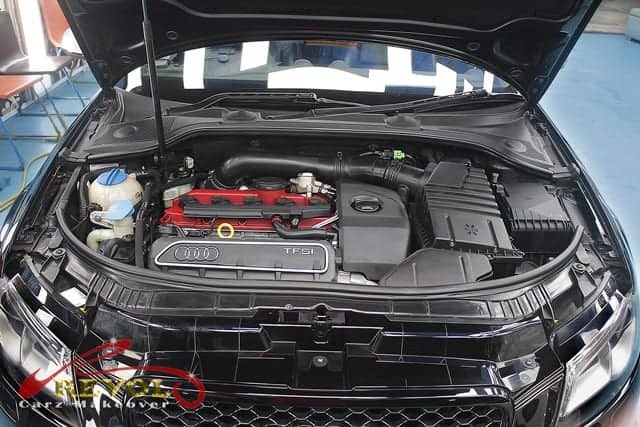 The compact Audi RS3 TFSI hot hatch zips from 0-100km/h in 4.3 seconds and the electronically limited top speed of 250km/h can be increased up to 280km/h with the lightning-fast shifting, the S-tronic 7-speed dual clutch transmission transmitting power to the Quatrro all-wheel drive. We invite you to take a virtual ride with us to our Revol Carz Makeover studio to experience the Audi RS’ wondrous transformation to a pristine showroom condition. 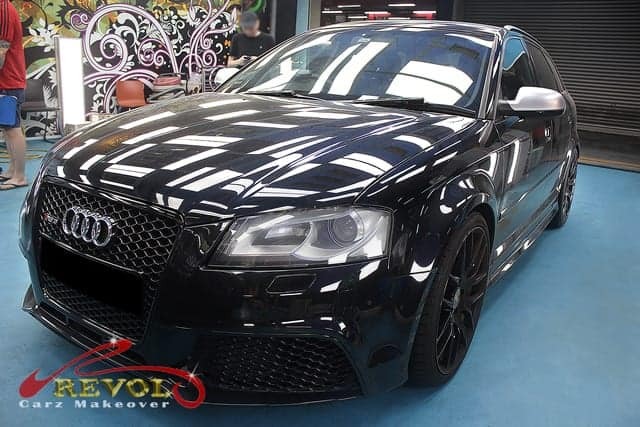 The Audi RS3 Sportback 2.5 TFSI arrives at Revol Carz Makeover for full body repainting. Note the paintwork is chalky with UV fading. The RS3 unmistakably bears the Quattro logo on its three-dimensional honeycomb grille. The rear view of the Audi RS3 Sportback before the repainting makeover begins. Our ego soars when the long-lasting shine surpasses the customer’s expectation. 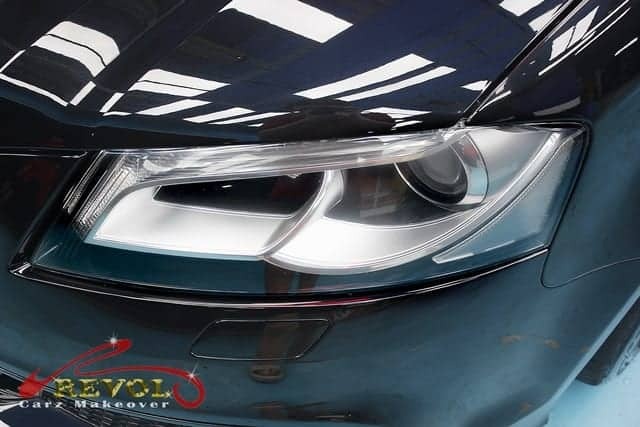 LED headlights with their distinctive daytime running light signature are manually polished to perfect showroom standard. Equally eye-catching is the ultra-clean engine bay that shows the dexterity of our passionate detailers. The super-clean and refreshed interior highlights Revol’s grooming distinctive standards. The flat-bottomed three-spoke leather multi-function RS Sport steering wheel with Alcantara inserts and gear-shift paddles in aluminum look, contrast stitching and RS logos add a touch of class after detailing. Door handles defaced with webs finger-nail scratches is a common eyesore without surface protective sealant. With a coat of our signature ZeTough Ceramic Paint Protection Coating, the despicable finger-nails scratches around the door handles is a thing of the past. Matt-look aluminum paint on the door mirrors is eye-catching. The RS3 steals the show after the Revol makeover. The blazing shine and polished LED tail-lights are phenomenal. 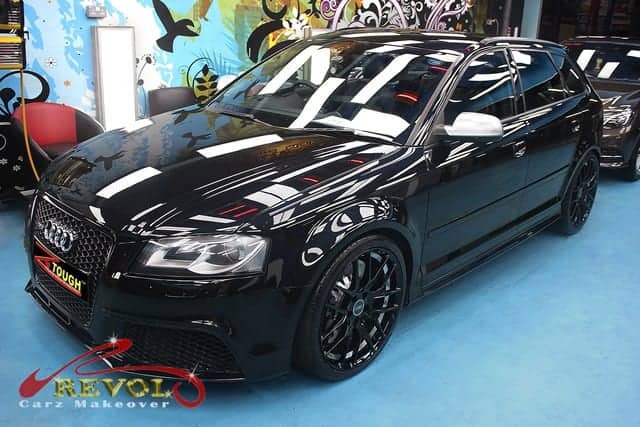 We create your ride of envy with Revol’s sensational makeover. 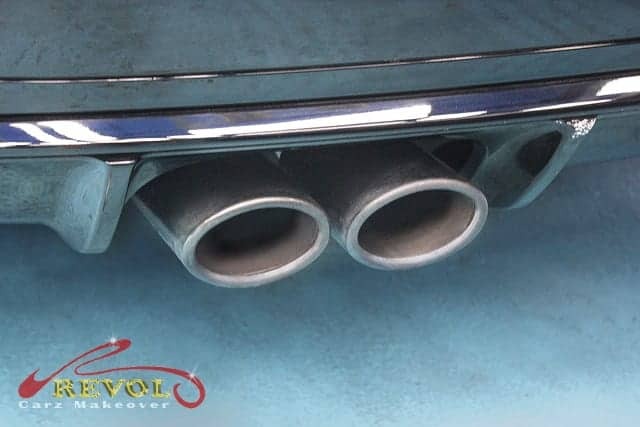 The twin-exhaust tailpipes neglected with thick soot need a specialised polishing job..
After manual polishing, the twin exhaust pipes are restored like brand new again. Would you believe we can restore wheels like these to showroom standard? 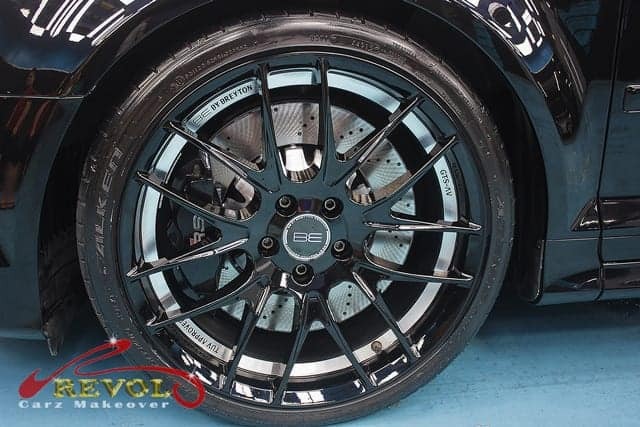 The RS 19” x 8.0J ‘5-arm-blade’ design alloy wheels with 235/35 R19 tires are restored to incredible showroom condition by our grooming experts. Our heartfelt thanks to all satisfied our customers for their supportive reviews on Revol Carz Makeover. 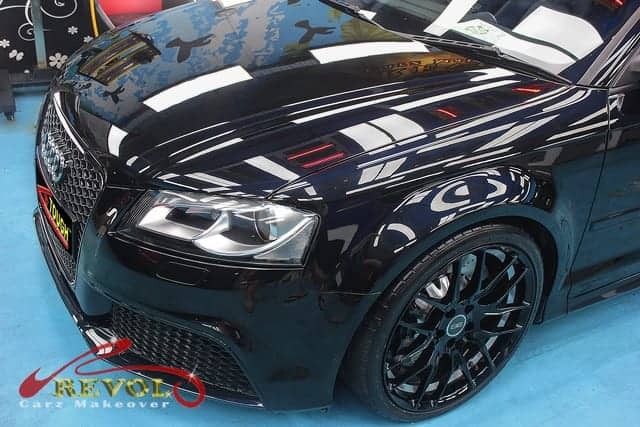 Express your distinction in the finest perfection in car re-paint and surface protection. Our proven, ZeTough Ceramic Paint Protection Coating gives you the best value for money. 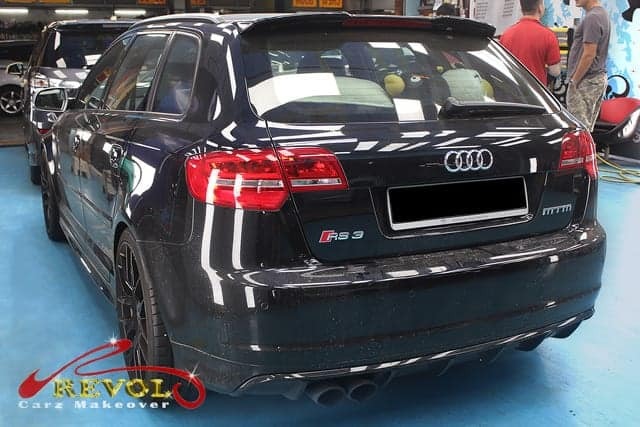 See how we have transformed the Audi RS3 Sportback to beyond showroom condition again? The spectacular result speaks for itself. The RS3 turns out more awesome than its former showroom condition and will glisten with greater permanence too.